Growing up in a Southern Baptist church and attending an Independent Baptist school definitely taught me ideas about women's place in society that were greatly at odds with what was going on at the time in the culture of the 1980s and even within my family's households. My grandmother, born in 1926, was one of the more fortunate children growing up during the Great Depression of the 1930s because her father had a job and was able to provide food, though not much else, for his family. My grandmother and her older sister were able to attend school, and my grandmother was a top student until she became ill. At 16 years old in 10th grade, my grandmother dropped out of school due to severe anemia, and soon after she married her sweetheart who was soon drafted into the army in World War II. At 17 years old she gave birth to her first child and soon after went to work for 18 months in a boot factory while her mother or sister cared for her child. After the war was over, my grandmother, who had regretted never finishing high school, studied and passed her GED (General Equivalency Degree) to earn her high school diploma. As an adult, she made sure to budget study time into her day with a couple of hours of reading about history, geography, archaeology, and Christian apologetics. Her subject of choice was the Bible, and she compiled a library of concordances and history books related to Biblical studies. Not wanting her studying to go to waste, she taught (women only of course) Sunday school and Women's Missionary Union. Probably a lot of what she taught was more complicated than most of the ladies were accustomed to learning, but I'm sure they learned something, and my grandmother had an outlet for her scholarly pursuits. Secretly, I always thought my grandmother was probably as well-studied as the pastor of the church (minus study of Greek, Hebrew, and Latin language). My mother was born in 1943, graduating from high school in 1961. Her high school years were spent when the Cold War was strong, and the US Department of Education made a push for more students to take math and science courses, even girls. As my mother was a bright student with good grades, she was selected for the higher level math and science courses, often one of 2 or 3 girls in a class of boys. My mom was a National Merit Semi-Finalist and was tied for 2nd in her class with the 2 students taking a test as a tie-breaker. As she was painfully shy and did not want to give a speech at graduation, she put incorrect answers so that she would be ranked 3rd. Her guidance counselor asked where she planned to go to college, and she didn't even know that was an option. Her guidance counselor helped her with entrance and scholarship applications, and my mom ended up getting a scholarship to Middle Tennessee State University. Unfortunately, she didn't know what she wanted to do and dropped out in the middle of junior year to get married, a marriage that ended a year later in divorce. My grandfather always regretted that my mother "wasted" her education and did not finish her degree. She was unfortunate enough to be born in a time when some women were just starting to pursue education and careers, but the feminist movement was not far enough along to sweep her along with it. She thought that she was supposed to become a homemaker, but she was as ill-suited for that as she was for the teaching degree that she had tried to pursue. Eventually, my mom worked for awhile and married again. My father didn't want kids, so he was upset when she was pregnant, and he told her that he wasn't paying for expenses related to the child. So my mother worked to save money for baby clothes, furniture, and a new washer and dryer. For a couple of years she was a stay at home mom as she had always thought women were supposed to be, but by the time I was 3 years old, my parents were separated and we had moved in with my grandparents. My mom was now a divorced mother in a conservative, religious community, and her shyness made it difficult for her to make friends. A friend at work took her to Parents Without Partners, where she met and married my stepfather and had another child within a year. It was at that point that she became a respectable member of the community again. When I was a senior in high school, our church was offering Philosophy of Christian Manhood and Philosophy of Christian Womanhood courses to those who wanted to participate. Mrs. B, the mother of one of my classmates, wanted her daughter to take the course, so she purchased the materials for unmarried women (at least, that's what I assume it was), Challenge of Christian Womanhood. There were 6 of us girls who met at Mrs. B's home on Saturday mornings to learn what it meant to be a proper Christian wife and mother. First it was explained that God created humans male and female with different strengths and weaknesses designed to complement each other. Males were supposedly designed to want to be leaders and protectors, with greater physical strength and analytical thinking skills than females. Born to be problem-solvers, males often relied on data rather than on intuition to make decisions. They also needed to have time on their own to "play with their toys" or to engage in recreational behaviors on their own, thriving on alone-time to "recharge". Females, on the other hand, were designed to be nurturers and caretakers, with a softer nature and lesser physical strength. Women were more intuitive thinkers, relying on emotion and "gut feelings" to make decisions. Women tended to congregate in groups and draw upon one another for strength or "recharging". Additionally, due to the designed natures of males and females, God created distinct roles for males and females to follow to have the best type of relationship. Of course, the only type of relationship that was sanctioned by God was a monogamous marriage between a man and a woman. 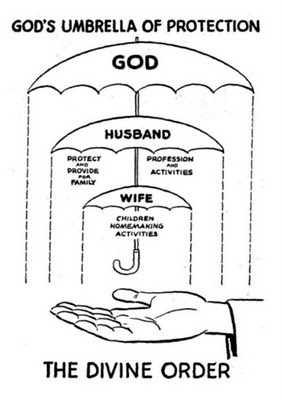 The man was designated the head of the family submissive only to God, with the wife being submissive to the man. A husband's role was to lead and protect the wife, and to love her and the children. He must be the example to the family of how to live a Godly life and to guide them both physically and spiritually. The wife's role was to submit to (and obey) the husband, to speak softly, to dress modestly, to take care of the children, and to praise the husband. A child's role in the family is to obey the parents at all times. These are the God-ordained roles of members of the family, designed for each person to work in perfect harmony under the laws of God. And of course, there should be daily prayer and Bible study as a family with the husband as the leader. These teachings made me extremely uncomfortable, the kind of uncomfortable where you feel your skin crawl and your stomach lurch with a tinge of nausea. We were told that if we felt uncomfortable with God's teaching, it was due to our sinful, rebellious nature, or that we allowed worldly influences to lead us astray. Or perhaps Satan was tempting us. In any case, it certainly wasn't due to anything faulty in God's perfect design. There were many things I felt were wrong with these teachings. First, I was the top math and science student in our grade, which requires a good amount of analytical thinking skills. If women were designed with lesser analytical skills, either I was an aberration (created wrong? nah, that isn't possible as God doesn't make mistakes) or the boys in my classes weren't using their God-given analytical skills to the best of their abilities. Second, we were told that just as a company cannot have two presidents, a marriage cannot have two leaders - there must be one designated leader, and that God had designed the male to be the leader. My problem was that a company chooses its president through an interview process in which the board will examine the credentials of candidates and find the best fit, not merely making its selection based on someone's genitalia and hormones. Simply designating the husband as the head of the family because of his birthright is the same as the "divine right of kings", and we all know how well that worked out throughout history. We were taught that since the role of a wife was to be submissive to the husband, then it was of utmost importance that we select our mate well through much prayer and discernment. God's plan for marriage was for one man and one woman to be mated for life, so one must be very sure about the person that one selects as a mate. (Actually, it's good advice for men and for women to spend a lot of time getting to know their potential marriage partner, to select well and to understand that marriage is a partnership that requires work and attention). At that point, I decided that if the male being designated the de facto head of the family was God's perfect design for marriage, then I was definitely remaining single. My mom and my grandma both took this course, but their reactions were quite different. My grandma, always striving to be the best Christian wife, mother, sister, daughter, friend, and servant of God as possible, swallowed the whole package hook, line, and sinker. I know that it didn't necessarily feel comfortable for her either, because I would hear her saying, "God says that I must be submissive to my husband, so......" whenever a situation requiring wifely submission would arise. What is interesting is that my grandfather had no interest in having a submissive wife at all - he loved my grandma and respected and asked for her opinion in all matters. My grandfather ingrained in me from the time I can remember that I should NEVER be dependent on a man, and that my education came first in order to ensure that I could have a career to support myself and my children. As his daughter had (in his opinion) "thrown away" her education and ended up twice-divorced, he never wanted to see his granddaughters in the same position. Too bad he passed away before seeing that as adults, my cousin and I followed his advice. I decided that if the male being designated the de facto head of the family was God's perfect design for marriage, then I was definitely remaining single.My mom, having married a man with severe learning disabilities that drove him to drop out of high school in 10th grade, considered herself to be the head of the family. They would discuss big decisions, but they both felt that she was the one who had more discernment regarding most matters of importance. She set the budget, paid the bills, made decisions regarding investments, large purchases, etc., and my stepdad was grateful to go along with her decisions. When I asked my mom her opinion of "Christian womanhood", she replied that we all knew that she was the one in her marriage best equipped to make decisions. So for her, that was the end of that discussion. Perhaps this style of relationship works for some couples who strongly believe in the concepts of God-designed marriage roles. However, I see a few pitfalls with this system even for the most fervent adherents. First, it puts undue pressure on the husband to make decisions for the family. I don't know how much the men's course stresses seeking the opinion of the wife, but in the women's course it was advised that a good husband will ask the wife's opinion, though he is not required to do so. In the end, it is clear that the husband is the responsible party. Also, I do not know in what way husbands were instructed to treat their wives, or whether women were presented as having inferior intellectual skills. I do know that women were instructed to stroke their husband's egos, to never nag or publicly disagree with their husbands, to give husbands their "well-deserved" space unbregrudgingly, and to make sure the children did the same. It seemed to me that other than the pressure of sole responsibility for decision-making, men had the better end of the bargain. Oddly enough, even though our Independent Baptist school incorporated a strict dress code with regard to male and female students, we were not indoctrinated with gender roles. It was understood that women were never to become pastors and were never to preach sermons, but teachers and administrators never treated male and female students differently in class. The only thing I can recall that was gender driven (other than dress code) was that boys were required to hold doors open for other students, regardless of other students' genders. Girls were not required to hold open the doors for other students, but we were encouraged to do so as a polite act. Did I remain single? No, I ended up finding a man whom I respect and who respects me in return. We are partners, a team, who discuss issues and come to a consensus. He is highly analytical but also highly emotional, whereas I am less emotional. He is quicker to reach a decision than I am, as I require time to consider all facets of potential outcomes of a decision. We both understand our own and each other's strengths and weaknesses, and never do we attribute those strengths and weaknesses to gender. It ended up that he is better at teaching and nurturing children, and I am not as good in those ways. He is self-employed, and I have a secure well-paying position. So we decided when our children were little that he would be home during the day and would work at night, while I worked in the daytime and would be home with the children at night. While in some parts of the country, at-home dads became more commonplace, in our part of the country and at the time, he was unusual (and often looked with suspicion). Our family situation was never easy, but we believe that our children have benefited from the best that we can offer to them, regardless of traditional gender roles. By tenets of "Christian Manhood and Womanhood", we should have had a different life, one in which our best skills were underutilized. As an aside, we are both agnostic atheists now, though that was not always the case. But we never subscribed to traditional gender stereotypes, and our children do not either.